زعفران (Crocus sativus L.) گران‌ترین محصول کشاورزی و دارویی است و فراهمی متعادل عناصر غذایی نقش بسیار مهمی در گل‌انگیزی و بهبود رشد بنه‌های مادری آن ایفاء می‌کند. با توجه به اهمیت اثر مدیریت حاصلخیزی خاک بر عملکرد گل زعفران، این آزمایش با هدف بررسی اثر کود دامی و تغذیه برگی بر ویژگی‌های بنه دختری و عملکرد گل در مزرعه شش ساله زعفران در قالب طرح پایه بلوک‌های کامل تصادفی با سه تکرار در محل مزرعه تحقیقاتی دانشکده کشاورزی دانشگاه فردوسی مشهد طی دو سال زراعی 93-1392 و 94-1393 اجرا شد. تیمارها شامل یارامیلاکمپلکس (A)، هیومستار (B)، کود کامل (C)، دلفارد (D)، کود دامی از نوع گاوی پوسیده (E)، E+A، E+B، E+C، E+D و شاهد بودند. بیست تن در هکتار کود دامی در اواخر پاییز ماه سال 1392 بر سطح خاک پخش شد. اعمال تیمارهای مختلف تغذیه برگی به صورت محلول‌پاشی برگی طی سه نوبت در مرحله رشد رویشی زعفران در اول صبح در اوایل و اواخر اسفند و اواخر فروردین ماه (با غلظت هفت میلی‌گرم بر کیلوگرم) انجام شد. نتایج نشان داد که اثر کود دامی و محلول‌پاشی بر وزن خشک فلس، برگ و بنه، طول برگ، سرعت ظهور برگ و گل، تعداد گل و وزن تر گل و وزن خشک کلاله زعفران معنی‌دار (01/0≥p) بود. بالاترین سرعت ظهور برگ و گل برای کود دامی+محلول‌پاشی با کود کامل به ترتیب با 34/7 برگ در روز و 17/11 گل در روز مشاهده شد. بیشترین وزن تر گل و وزن خشک کلاله برای کود دامی+محلول‌پاشی با کود کامل به ترتیب با 77/69 و 66/0 گرم بر متر مربع به دست آمد و کمترین میزان برای شاهد با 30/27 و 26/0 گرم بر متر مربع حاصل شد. بدین ترتیب‌، با در نظر گرفتن لزوم بکارگیری مدیریت اکولوژیک و عدم وجود سیستم ریشه‌ای گسترده در زعفران، توصیه می‌شود جهت افزایش تولید به ویژه در مزارع چندساله از کودهای آلی به ویژه کود دامی همراه با تغذیه برگی استفاده گردد. Figure 1- Mean comparisons for the effect of manure and foliar spraying on (a) leaf and (b) emergence rates of saffron. Figure 2- Mean comparisons for the effect of manure and foliar spraying on flower number of saffron. Figure 3- Mean comparisons for the effect of manure and foliar spraying on (a) fresh weight of flower and (b) dry weight of stigma for saffron. Saffron (Crocus sativus L.) is the most expensive spice and 95% of its global production is in Iran. 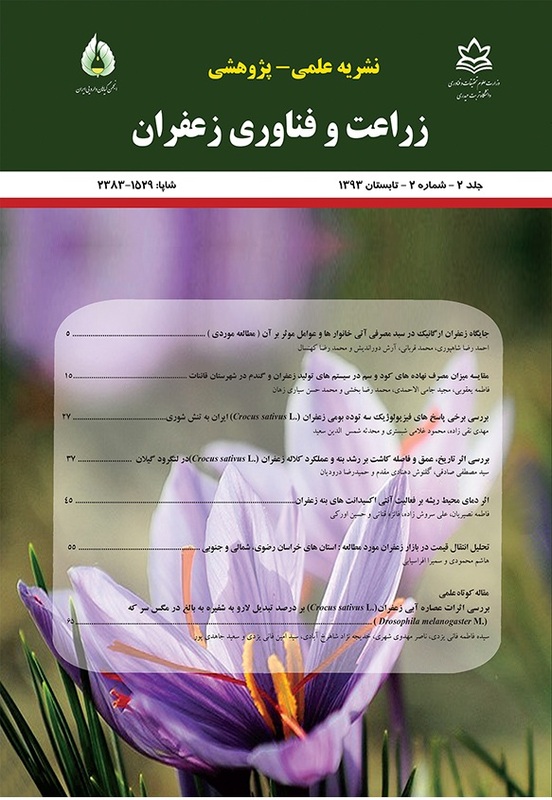 In order to study the effects of cow manure and foliar spraying on criteria of daughter corms and flower yield in six year-old saffron, an experiment was conducted based on a randomized complete block design with three replications at the Agricultural Research Station, Ferdowsi University of Mashhad during two growing seasons of 2013-2014 and 2014-2015. Treatments were Yaramilla complex (A), Humestar (B), True fertilizer (C), Delfard (D), manure fertilizer as composted cow manure (E), A+E, B+E, C+E, D+E and control. Twenty t.ha-1 of cow manure were applied at the end of fall on the soil surface. Foliar nutrient treatments were sprayed at three times during vegetative stage of saffron (7 mg.kg-1). The results showed that the effects of cow manure and foliar spraying were significant on dry weight of tunic, dry weight of leaf, dry weight of corm, leaf length, leaf appearance rate, flower emergence rate, flower number, fresh weight of flower and dry weight of stigma for saffron (p≤0.01). The highest leaf appearance rate and flower emergence rate were observed in C+E with 7.34 leaves per day and 11.7 flowers per day, respectively. The maximum fresh weight of flower and stigma dry weight were obtained in C+E with 69.77 and 0.66 g.m-2, respectively. These lowest amounts were obtained in control with 27.30 and 0.26 g.m-2, respectively. The application of cow manure resulted in enhanced growth and yield of corm and flower. Also, foliar spraying improved flowering rate, flower yield and stigma yield of saffron due to increasing in production assimilates and their translocation to corm and below ground organs. Akbarian, M.M., Heidari Sharifabad, H., Noormohammadi, G., and Darvish Kojouri, F. 2012. The effect of potassium, zinc and iron foliar application on the production of saffron (Crocus sativa). Annals of Biological Research 3 (12): 5651-5658. Akhtar, S., Shakeel, S., Mehmood, A., Hamid, A., and Saif, S. 2013. Comparative analysis of animal manure for soil conditioning. International Journal of Agronomy and Plant Production 4 (12): 3360-3365. Amirghasemi, T. 2001. Saffron, Red Gold of Iran. Ayandegan Publication, Tehran, Iran. (In Persian). Asadi, G.A., Rezvani Moghaddam, P., and Hassanzadeh Aval, F. 2014. Effects of soil and foliar applications of nutrients on corm growth and flower yield of saffron (Crocus sativus L.) in six year- old farm. Saffron Agronomy and Technology 2 (1): 31-44. (In Persian with English Summary). Badiyala, D., and Saroch, K. 1997. Effect of seed corm size and planting geometry on saffron (Crocus sativus L.) under dry temperate conditions of Himachal Pradesh. Indian Perfumer 41: 167-169. Balemi, T. 2012. Effect of integrated use of cattle manure and inorganic fertilizers on tuber yield of potato in Ethiopia. Journal of Soil Science and Plant Nutrition 12 (2): 253-261. Behdani, M.A., Koocheki, A., Nassiri Mahallati, M., and Rezvani Moghaddam, P. 2005. Evaluation of quantitative relationships between saffron yield and nutrition (on farm trial). Iranian Journal of Field Crops Research 3 (1): 1-14. (In Persian with English Summary). Benschop, M. 1993. Crocus, In: The physiology of flower bulbs. Hertogh, A., de. Nard, M. Leed. (Eds.) Amsterdam, Elsevier. Coelho, D.T., and Dale, R.F. 1980. An energy crop growth variable and temperature function for predicting corn growth and development: planting to silking. Agronomy Journal 72: 503-510. Eghball, B., Wienhold, B.J., Gilley, J.E., and Eigenberg, R.A. 2002. Mineralization of manure nutrients. Journal of Soil and Water Conservation 57: 470-473. El-Naggar, A.H., and El-Nasharty, A.B. 2009. Effect of growing media and mineral fertilization on growth, flowering, bulbs productivity and chemical constituents of Hippeastrum vittatum, Herb. American-Eurasian Journalof Agricultural andEnvironmental Sciences 6: 360-371. Gresta, F., Lombardo, G.M., Siracusa, L., and Ruberto, G., 2008. Effect of mother corm dimension and sowing time on stigmas yield, daughter corms and qualitative aspects of saffron (Crocus sativus L.) in a Mediterranean environment. Journal of the Science of Food and Agriculture 88: 1144–1150. Ghorbani, R., and Koocheki, A. 2006. Organic saffron in Iran: prospects challenges. Proceedings of the 2nd International Symposium on Saffron Biology and Technology. Mashhad, Iran. 28-30 October 2006, p. 369-374. (In Persian). Hatami Sardashti, Z., Jami Al-Ahmadi, M., Mahdavi Damghani, A.M., and Behdani M.A. 2011. Evaluation of sustainability in saffron agroecosystems in Birjand and Qaen counties. Journal of Agroecology 3: 396–405. (In Persian with English Summary). Hosseini, M., Sadeghi, B., and Aghamiri, S.A. 2004. Influence of foliar fertilization on yield of saffron (Crocus sativus L.). Acta Horticulturae (ISHS) 650: 207-209. Jahan, M., and Jahani, M. 2007. The effects of chemical and organic fertilizers on saffron flowering. Acta Horticulturae 739: 81–86. Kafi, M., Rashed Mohasel, M.H., Koocheki, A., and Mollafilabi, A. 2002. Saffron, Production and Processing. Zaban va Adab Press, Iran. 276 pp. (In Persian). Kartikeyan, B.C., Abdul Jaleel, G.M., Lakshmanan A., and Deiveekasundaram, M. 2008. Studies on rhizosphere microbial diversity of some commercially important medicinal plants. Colloids and Surfaces B: Bionterfaces 62: 143-145. Kizilkaya, R. 2008. Yield response and nitrogen concentrations of spring wheat (Triticum aestivum) inoculated with Azotobacter chroococcum strains. Ecological Engineering 33: 150–156. Koocheki, A. 2004. Indigenous knowledge in agriculture with particular reference production in Iran. Acta Horticulture 650: 175-182. Koocheki, A. 2013. Research on production of Saffron in Iran: Past trend and future prospects. Saffron Agronomy and Technology 1 (1): 3-21. (In Persian with English Summary). Koocheki, A., Jahani, M., Tabrizi, L., and Mohammadabadi, A.A. 2011. Investigation on the effect of biofertilizer, chemical fertilizer and plant density on yield and corm criteria of saffron (Crocus sativus L.). Journal of Water and Soil 25 (1): 196-206. (In Persian with English Summary). Koocheki, A., Rezvani Moghaddam, P., Mollafilabi, A., and Seyyedi, S.M. 2013a. The effects of high corm density and manure on agronomic characteristics and corms behavior of Saffron (Crocus sativus L.) in the second year. Journal of Saffron Research 1 (2): 144-155. (In Persian with English Summary). Koocheki, A., Tabrizi, L., Aminghafori, A., and Khorramdel, S. 2012. Evaluation of growth characteristics and yield of saffron (Crocus sativus L.) by application of organic planting beds and different sowing methods. Agroecology 2 (2): 16-30. (In Persian with English Summary). Leithy, S., El-Meseiry, T.A., and Abdallah, E.F. 2006. Effect of biofertilizer, cell stabilizer and irrigation regime on rosemary herbage oil quality. Journal of Applied Sciences Research 2: 773-779. Moayedi Shahraki, E., Jami Al-Ahmadi, M., and Behdani, M.A. 2010. Study of energy efficiency of saffron (Crocus sativus L.) in Southern Khorasan. Journal of Agroecology 2: 55–62. (in Persian with English Summary). Mohammadi, K., Heidari, G.R., Tahsin Karimi Nezhad,M., Ghamari, S., and Sohrabi Y. 2012. Contrasting soil microbial responses to fertilization and tillage systems in canola rhizosphere. Saudi Journal of Biological Sciences 19 (3): 377–383. Mollafilabi, A. 2004. Experimental finding of production and echo physiological aspects of saffron (Crocus sativus L.). I. International Symposium on Saffron Biology and Biotechnology. Albacete, Spain. Naderi Darbaghshahi, M.R., Khajeh Bashi, S.M., Bani Taba, S.A., and Dehdashti, S.M. 2008. Effects of method, planting density and depth on the yield and operation duration of agronomic saffron field in Isfahan region. Seedling and Seed 24: 643-657. (In Persian with English Summary). Negbi, M., Dagan, B., Dror, A., and Basker, D. 1989. Growth, flowering, vegetative reproduction and dormancy in the saffron crocus (Crocus sativus L.). Israel Journal of Botany 38: 95-113. Nelson, N.O., and Janke, R.R. 2007. Phosphorus sources and management in organic production systems. Horticultural Technology 17 (4): 442-454. Omidi, H., Naghdi Badi, H.A., Golzad, A., Torabi, H., and Footoukian, M.H. 2009. The effect of chemical and bio-fertilizer source of nitrogen on qualitative and quantitative yield of saffron (Crocus sativus L.). Journal of Medicinal Plants 8 (2): 99-109. (In Persian with English Summary). Pandey, D., and Srivastava, R.P. 1979. A note on the effect of the size of corms on the sprouting and flowering of saffron. Program in Horticulture 6 (23): 89 - 92. Rasoulzadeh, A., and Yaghoub, A. 2010. Effect of cattle manure on soil physical properties on a sandy clay loam soil in North-West Iran. Journal of Food, Agriculture and Environment 8 (2): 976-979. Rezvani Moghaddam, P., Khorramdel, S., Amin Ghafori, A., and Shabahang, J. 2013a. Evaluation of growth and yield of saffron (Crocus sativus L.) affected by spent mushroom compost and corm density. Journal of Saffron Research 1 (1): 13-26. (In Persian with English Summary). Rezvani Moghaddam, P., Khorramdel, S., and Mollafilabi, A. 2015. Evaluation of soil physical and chemical characteristics impacts on morphological criteria and yield of saffron (Crocus sativus L.). Journal of Saffron Research in Press. (In Persian with English Summary). Rezvani Moghaddam, P., Koocheki, A., Mollafilabi, A., and Seyyedi, S.M. 2013b. Effect of biological and chemical fertilizers on replacement corm and flower yield of saffron (Crocus sativus L.). Iranian Journal of Crop Science 15: 234–246. Rezvani Moghaddam, P., Mohammad abadi, A.A., Fallahi, J., and Aghhavani Shajari, M. 2010. Effects of chemical and organic fertilizers on number of corm and stigma yield of saffron (Crocus sativus). 59th International Congress and Annual Meeting of the Society for Medicinal Plant and Natural Product Research. Sadeghi, B. 1993. Effect of Corm Weight on Saffron Flowering. Khorasan Research Organization for Science and Technology, Khorasan, Iran 73 pp. (In Persian). Sampatha, S.R., Shivashankar, S., and Lewis, Y.S. 1984. Saffron (Crocus sativus L.)cultivation, processing chemistry and standardization. Critical Reviews in Food Science and Nutrition 20 (2): 123-157. Sarmadnia, G.H., and Koocheki, A. 2001. Crop Physiology. Jihad Daneshgahi Publication of Mashhad, Iran. (In Persian). Senesi, N. 1989. Composted materials as organic fertilizers. Science of the Total Environment 81-82: 521-542. Shirani, H., Abolhasani Zeraatkar, M., Lakzian, A., and Akhgar, A. 2011. Decomposition rate of municipal wastes compost, vermi compost, manure and pistaco compost in different soil texture and salinity in laboratory condition. Water and Soil 25: 84–93. (In Persian with English Summary). Torabi, M., and Sadeghi, B. 1995. Pattern of nutrient changes in leaf and corm of saffron during growth period. Abstract of the Second National Symposium on Saffron and Medicinal Plants. 8-9 November 1994, Gonabad, Iran. (In Persian).